URL stands for Uniform Resource Locator and is the unique link that you would enter to navigate to a specific webpage. For example, the URL for GiveGab is https://www.givegab.com/. Whenever you sign your organization up for GiveGab, you are automatically assigned a URL for your organization's profile. Your organization's URL will include www.givegab.com with additional information (what we call a "slug") about your organization's name after the GiveGab URL. It is your organization's unique "slug" that this article will show you how to update. From the "Overview" Tab of your Admin Dashboard click the "Edit Organization Info" button on the right sidebar. 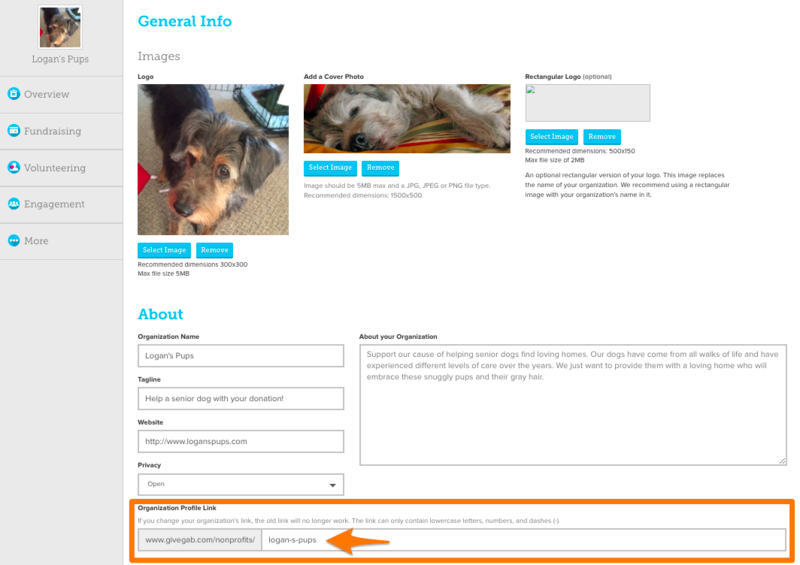 After you click "Edit Organization Info" you'll be directed to the page titled "General Info." From this page you can edit or update your organization's profile link. The section of the link that you want to edit is known as your organization's "slug." When editing your slug please note that slugs cannot include any capital letters, spaces, or underscores. They should only contain lowercase letters, numbers, and dashes. Once you have completed the updates you want to make to your slug, scroll to the bottom of the screen and click "Save Changes." Your new link should work automatically! Step 3: Notify Your Organization's supporters of your new URL. 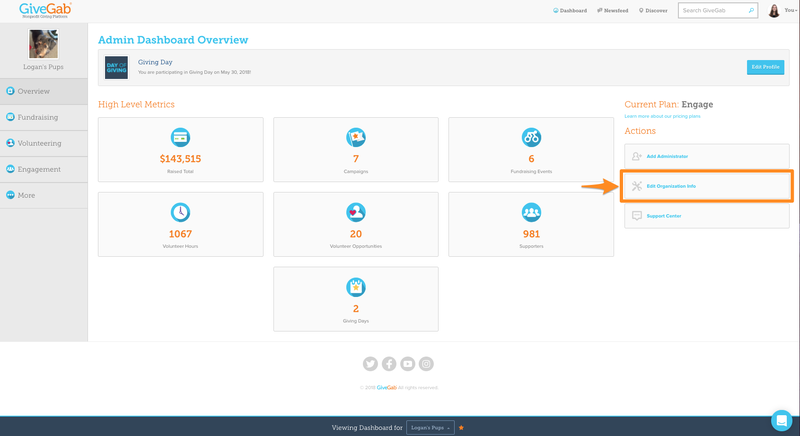 Keep in mind that, once you update your link on your admin dashboard, your old link will no longer work. You should notify your supporters of any changes that you make and change your links on social media and other website or marketing materials so that your supporters are not accidentally navigating to a link that is no longer active!